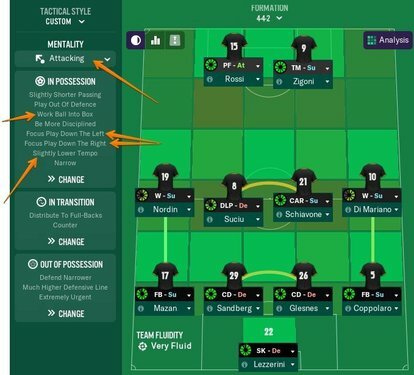 You should first create a separate thread and post a screenshot of your tactic there, so that people can analyze the tactic and give you some advice. So, you play with this 4-4-2? I like the changes you made in relation to these 2 roles Btw, how do you assess the suitability of players for a certain role? Do you look at their attributes and traits, or simply follow what the game suggests? - one-dimensionality on the flanks (both fullbacks and both wide midfielders have the same role and duty - FB and winger respectively). Add some variety (for example, one winger can be changed to an IW). - why "be more disciplined"? - why narrow att width? - why narrow def width? - why work ball into box? I don't say that any of these is wrong, just curious to know the reasoning behind using them. I will admit i did look at the game suggestions but it seems to have payed of the advanced forward was the league top scorer with 19, barrella is the bbm so he definitely had the attributes for the box to box I want more up and down to contribute further forward more than what the Carrillo offers. As to the majority of the questions I didn’t make the tactic but due to it being Sacchi inspired I believe he aims for compactness so that’s why width is narrow and the defensive line is high. Also i believe Sacchi was keen at pressuring the opposition. The play out wide I toggle depending on what I see, if they double my wide men I take it off. You suggesting it’s to much the same down the flanks would be correct, but they have inside forward preferred moves, so they do cut inside and offer something different allowing the fullbacks to overlap. Game suggestions are sometimes right, but sometimes not really. So looking at a player's attributes and traits (in some cases footedness as well) is something I would highly recommend. And I am not talking only about these two players (AF and BBM), but in general. Well, if you want to replicate a certain RL manager/tactical style, then you should manage a team that has suitable players for that style. Maybe your team has suitable players, but the replication is not quite correct? Impossible to say anything for sure based on the info you provided. Again, without knowing your players, all this is just my speculation. Maybe 442 simply isn't an ideal formation for your team? Maybe you should try something different (4141dm wide for example)? Really don't know. I appreciate you don’t know the fully know the system or the players, but the tactic does work for them we’ve played well and got results against Juventus Napoli and both Milan’s. What I’m asking is what would people advise I do against teams that I’m better than, that camp ten men in the box and are impossible to break down. I appreciate the input you’ve given and it’s really thought out but rather than wholesale changes to the system is there not an team instruction or instructions that I could change or maybe tinker with the players that would break them down. I don't think there's any magic bullet, but if you keep tempo high and LOE/DL/CD high, you will usually dominate and batter underdog clubs until you find a breakthrough. Also I recommend using "run at defense" as dribbling can be very strong in this ME but players are often reluctant to try it. As I already said in my first reply to you, I fear that the only way to get some more meaningful help (advice) with the kind of problem you are having is to create/open a separate thread/topic, where you will (again) explain your problem and post screenshots not only of the tactic but - preferably - also of your players' profiles. When I face ultra-defensive opposition that is difficult to break down, I make tweaks during the course of the match based on what I see. Because I don't have a magic formula that I apply to each single situation. In my Man Utd save, there are a lot of teams that play very defensively against us. In most cases I do manage to break them down, but I know my team, I analyze the opponent, watch the match carefully and adjust the tactic accordingly. 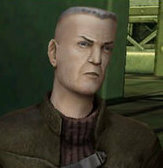 And btw, I use a pretty much different system from yours. Fair comment, I suspected that it wouldn’t be as much as it’s a x problem do y solution. I know I’m not the most adept at reading what the match engine gives me and it’s something I need to improve on. Once again I appreciate the help you’ve already gave me, I’ll try to implement some of the ideas you’ve already gave me and see if that remedy’s the issue I’m having. I am reluctant to post a whole topic about it because it’s not my tactic. Sorry about the dumb question, but how do you watch a match that already happened? Like not only the highlights but the whole match. I only get the option to see by highlights. I've placed numerous adverts for coaching staff but I'm unable to view any applicants. Where does one find them? After a while you should get a message in your in box saying that the advert has had a good, average, or poor result and give you a list of people who have applied for the particular role that you advertised. Be patient. I normally manage amateur sides and there are no physios in the staff available list. When I advertise I get regular 'no interest' updates until after January when one person might rock up. You can set the team selection for them. He'll swap in players as needed i.e. due to fatigue, injury etc. Quick question. I play with a team from the spanish first division and we have the B team system. How can I take control of the B team training? I tried making me the B team's manager but the individual training is still greyed out. The B team is in the league below the last playable league, so the spanish 4th division. Will I be able to control the training only if they promote to a playable league and after I hire a few coaches? Right now, the only people in the B team's staff are the chairman, HOYD, and DoF. I want to do it because I read about an experiment that someone did, and he couldn't get his B team promoted. He tried raising their reputation with the editor, which I also did, but only the non-B teams were getting promoted. Then the next season he moved his best youth prospects to the B team and didn't touch the schedule anymore, he didn't arrange any friendly game, and at the end of the season they got promoted to the playable league without modifying the team's reputation. I’m pretty sure that you can’t take control of the training under any circumstances. Spanish B teams are very closely affiliated clubs. You can transfer players between the main team and the B team during the transfer season and you can also hire the B team staff. I’m sure that you can’t do anything else. I can transfer players at any time between the two squads, I can also set tactics. Why I am not able to set up training, more importantly the individual training. I bet that the first team manager and staff can tell to the B team staff how to tailor a player's training to suit their philosophy in real life. Like Barcelona is doing. The first team and B team even share the same facilities. That's probably more a philosophy thing for the DoF or HoYD to be fair, leaving the manager or Head Coach to deal with the first team alone, although I don't think that particularly new element of modern football is implemented too well in game thus far. I can even make myself the b team's manager, but I still can't take control of the training. All players are currently training in their playing position, not in a specific role and duty. Not sure about that. Doesn't seem right. Somebody must know bud. 2. I've seen in other threads that for youth training is more important than matches so they can have a higher match load. Is it worth it to still schedule a friendly if there's no match one a week to keep match fitness up? I would assume yes to keep injuries down, but then it seems like you get less training. I'm just curious to hear what others' experience has been. What a difference of creating chances in balanced mentality in compare of positive? In balanced I have a possession but looks like not enough something for score a goals. More risks in PI not helped / not enough. If a player has the trait “Cuts inside from the flank”, will that make him cut EVEN more inside when playing like an IF, than if he didn’t have the trait? What i mean is, that playing with both the trait and the PI from the IF-role, will that make him “double” the likelyhood of him cutting inside? He will look to cut inside whenever possible. Occasionally though he might be forced to run out wide by the way of opposition defending. And IF he has the trait playing as a winger, he will do both? The answer i was if he would look to do it MORE with both the trait and the PI, than if he didn’t have the trait but only the PI. 1. Yeah, training praise can increase Work Rate in certain players. Its why I avoid it once WR hits 15 unless I really want someone to have a Kanté-esque work rate. 2. Training is more important up to 18, yes. If you only have 1 match a week, you can still get a lot of training done though, as you can use all 3 slots on each day (but I wouldn't advise sticking 3 Endurance sessions in 1 day). If a player has the trait "Cuts inside from wing(s)", he will look to cut inside whenever he can, no matter which role he is played in. If played as a winger, he'll tend to do some more crossing, but will not stop cutting inside. Since I’ve always been interested in developing youngsters in FM and in real life (basketball coach here) I took it upon myself to start the Youth Only challenge. Italy seemed like a nice place to get the ball rolling so I’m starting there. After simming an entire season I took the job of newly promoted to the Serie C; Fidelis Andria. At the start of the season we were very good and now it all turns to ****. We were predicted 20th and got as high up as 5th. Clearly we were overachieving and now we lose from practically everyone. So I went back to the drawing board. Team instructions: more direct passing, higher tempo, regroup, counter, distribute quickly, distribute over opposition defensive line, lower LOE, tighter marking. Personal instructions: only the CMs has “get further forward” as I want him to join in on the attack when he is able to. In terms of the squad: hardly any of them are Serie C worthy but wingers and full backs have decent pace and crossing. Central midfielders have decent passing and work rate. Both attackers are alright but the poacher is 1m93, has decent jumping/heading and has great pace. He also has 14 finishing I believe. The AFa in terms of attributes is my best player but so far I cannot get him to work. He’s a creative type of player with decent physicals and workrate. Any advice? I get that the tactic seems one dimensional but I lack the tactical knowledge and talent in the squad (especially depth) to make this work. As for strikers, when I use both of them on attack duty, I look to consider their speed, movement (off the ball) and footedness in the first place. The AF/PO combo can work of course, though I personally prefer DLFat/PO or PFat/PO or DLFat/AF, depending on the type of players. Because these combos create a bit more space between them, even if they are both on the same (attack) duty. In your system with AF and PO, if they are both right-footed, I would put the AF on the right and tell him to stay wider, while the PO would be on the left, so that he would be better positioned to utilize assists from the right as well as from the midfield (both passes and crosses). 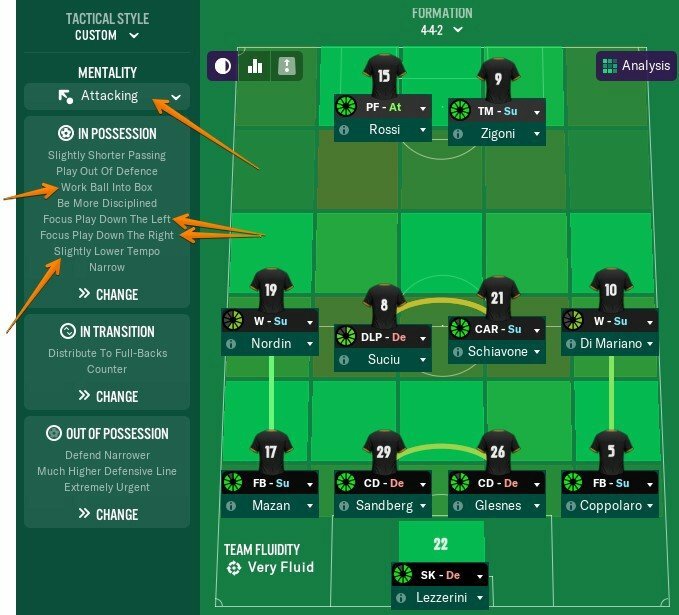 So I got the idea of creating a catenaccio-style, suffocating low-event system for my team, but I don't really know where to start. Has anyone had any success implementing that type of tactics? Are the default catenaccio tactics any good or am I better off starting from scratch? The 5-1-2-2 formation used by Leonardo Semplici at SPAL in the game really interests me and I'd like to work with the same formation. Second game was another 0-2 loss. 8 shots vs 31. I can only assume that your team is poor at defending, meaning they cannot resist a lot of pressure in your half for long periods of time. But you can try a counter-attacking style on a bit higher mentality (albeit with somewhat different instructions). It does not necessarily need to be cautious or defensive. If I switched it around to positive, it'll move me up the pitch and will be more risky going forward. Since the passing and tempo will be higher already I'll drop the 'more direct' and 'higher tempo' TI's. We'll see how it goes. You may not even need to drop tempo. If you watched Rashidi's Stalybridge diaries when the team was a complete underdog in lower leagues, he played nice counter-attacking football on positive mentality with higher tempo, shorter passing, early crosses and pass into space in possession (cannot exactly remember what other possession TIs he was using back then, but you can tweak and see what combination works for your team). However, he didn't use a 442 system (I think it was 4141dm wide, if not even 4231). It's risky though, but may work. Alternatively, you can try with Balanced, rather than immediately switching to Positive.